The Flynet DataConnect query editor allows you to build simple and complex SQL queries alike. These queries are ultimately made available as web methods on an XML web service. Web services can be used by clients such as SAP Dashboard Design / Xcelsius. A query is made up of a number of sections (clauses) that let you specify what data you would like to see and how you would like to filter and order it. It can also take input parameters so you can change the filter range dynmically. 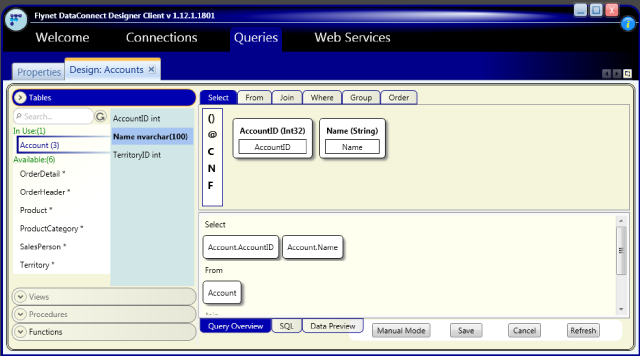 To start designing a new query you must first create a working connection, and then create a new query that uses this connection. Once you have done this, you can enter design mode. If you are using a database that supports DataConnect's Full Experience, you will be able to create queries using a drag and drop tile interface.